Weather patterns on Mars were fairly typical last week. Large dust lifting activity associated with the defrosting south polar seasonal ice cap continued over southern Sirenum and Aonia. 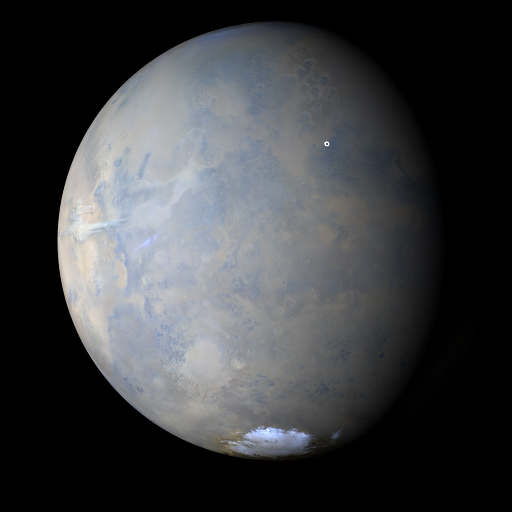 The western hemisphere of these polar latitudes also had some small dust storms and clouds of dust. Looking further to the low-latitudes, Sirenum, Noachis, and Cimmeria each had a local-scale dust storm or two. Condensate water ice clouds were observed over south of eastern Valles Marineris and Arsia Mons (southernmost volcano of the Tharsis Montes) for most afternoons. Skies remained storm-free for rover sites, Gale Crater (Curiosity) and Endeavor Crater (Opportunuty) throughout the week. Malin, M. C., B. A. Cantor, A. W. Britton (2018), MRO MARCI Weather Report for the week of 1 October 2018 – 7 October 2018, Malin Space Science Systems Captioned Image Release, MSSS-551, http://www.msss.com/msss_images/2018/10/10/.